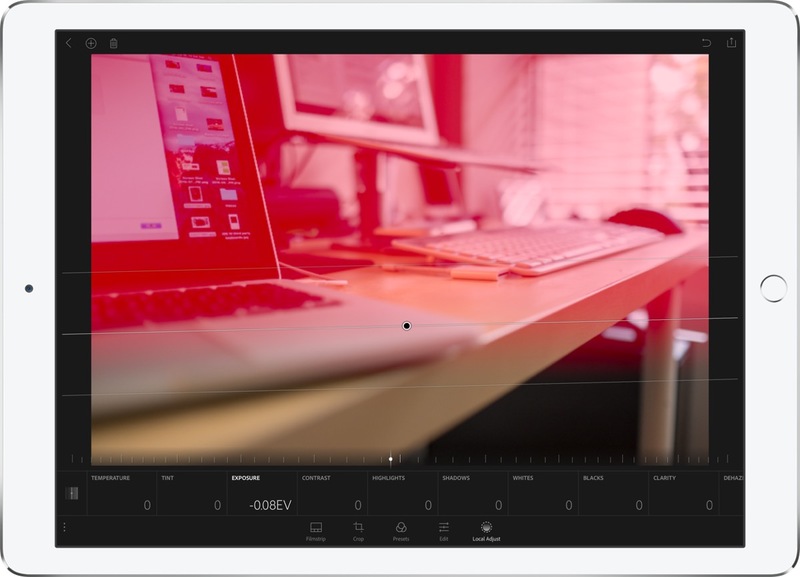 Lightroom 2.4 for iPad: RAW Editing, Keyboard Shortcuts, and More! Lightroom 2.4 for iOS came out last week, and I’ve been using it quite a lot over the past few days. The big breakout features are RAW edits and local adjustments, so let’s dive right into those. RAW files are big and harder to process than JPEGs, but they provide a lot more room to edit colours, highlights, and shadows. Until this update, there really hasn’t been any elegant way to manage and edit them on the iPad. So the simple fact that Lightroom can now handle RAW files — on iOS 9 no less — is awesome. I would have really enjoyed having this capability during my Japan trip (although it probably would have meant staying up later processing photos). My 128 GB iPad still lacks the storage space to keep everything on board, but it definitely has enough room to download my shots after a few days of shooting. This matches the way I approch RAWs very well, since I tend to keep just the JPEGs, and only bring a RAW file out when I’ve messed up exposure and need more leeway for editing. The new local adjustments help a lot with this as well. You can’t quite brush changes on yet, but you can add linear or radial gradients to an image. Once you’ve specified the portion of the image you’d like to change, you can locally tweak things like exposure, saturation, sharpness, contrast, and much more. You can also have several of these adjustments on a single image, so you can use one to darken the sky, and another one to lighten up a friend’s face if it wasn’t exposed properly. There are definitely other apps on iOS that enable localized changes, but none of them are set up to also manage a huge library of photos. 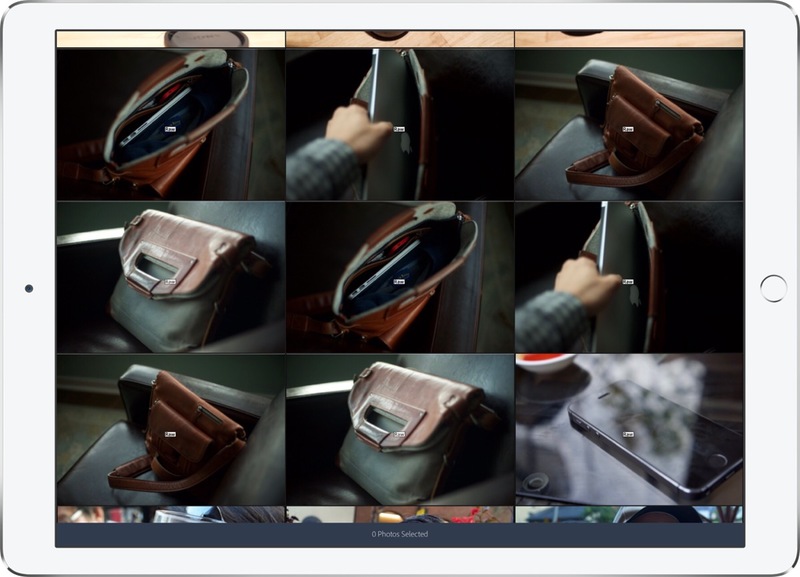 The ability for Lightroom to sync full resolution images to mobile devices was added in March, and it means that any full-res files uploaded from an iOS device can be downloaded in full on another iOS device. That may not sound like a big deal because it’s how iCloud Photo Library works on iOS, but Lightroom just wasn’t able to do that before March 2016. This latest update iterates on that change a little further and has added a “Download full resolution” switch in the sidebar. If you turn this switch ON, then the behaviour from March will stick: any files you edit, or which are part of a collection you’ve earmarked for offline access, will be downloaded in full. However, if the switch is off, then Lightroom will only download Smart Previews to that device. These Smart Previews are decent for viewing without zooming in, and they’re much smaller than full-sized images at around 400kb per shot. This is a useful change for smaller devices where you might want offline access to your shots, but don’t need a full resolution version because the screen can’t really take full advantage of it. My iPhone 6S Plus comes to mind for this. I’ve been syncing Smart Previews to the iPhone, and I sync the last year’s worth of pictures in full resolution to the iPad Pro (through a Collection called 2016). The last awesome change added in this latest Lightroom update were keyboard shortcuts. There aren’t as many as the desktop version, but wow they came out with a lot of them out of the gate. You can change view modes, flag and star pictures, and move from picture to picture — all from the keyboard. This is a really great experience on the iPad Pro, and it’s surprising that Apple’s own Photos app still doesn’t have any shortcuts of its own. Lightroom is priced pretty competitively at 10 USD per month, although you do have to purchase it as an annual plan, which does mean a certain amount of lock-in. However, given the two major updates in March and July, my enthusiasm for Adobe’s products on iOS has been totally rejuvenated. I’ll likely stay a subscriber for at least this first year, just to see what else they have up their sleeves. I’m really hoping to see faces, keywords, and smart collections make their way to mobile in 2016.